So, obviously it’s rolling around to that time of year again. The lights are up, the Christmas trees are being decorated, and the house smells of pine and all that good stuff. Notice how I didn’t mention Christmas presents, that’s because every time I think of the amount of presents I have to get, I go into full panic mode. I’m sure some of you can relate. Anyways, I’m not here to talk about how stressful the run-up to Christmas can be. 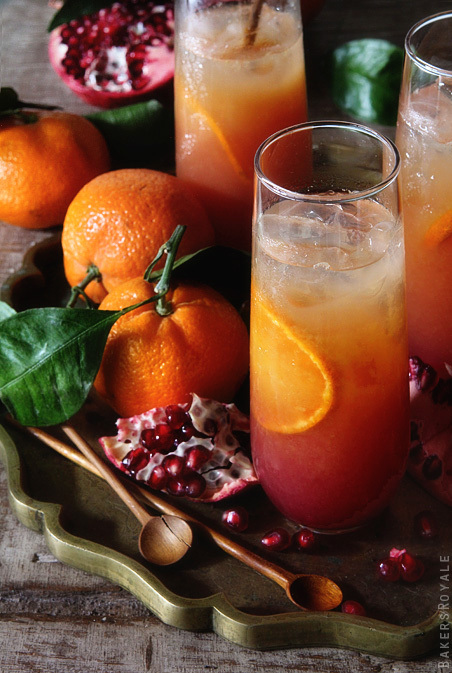 Today I’ll be talking about 6 Christmas cocktails that you can make yourself – YES, you heard me, “make yourself.” These all sound amazing and taste even better. They’re really handy for all those Christmas parties, girlie get togethers and even if you just have people visiting you for a few drinks. Cheers to the holidays! Mule is a classic around Christmas time and the fact that you can make a cocktail out of it makes it even better. This is a new take on the Moscow Mule and taste literally like heaven on earth, especially if you’re a huge fan f spiced goodness. 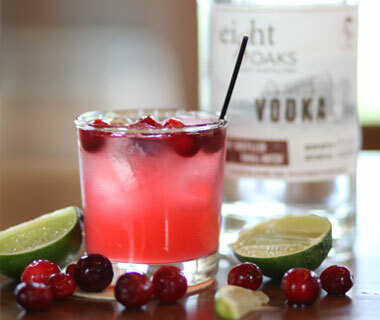 This drink calls for cranberry, ginger beer and spiced rum, then is topped with sugared cranberries as garnish. Now, I know this sounds like a more summery type of drink, but trust me – it works for Christmas too. There are just filled with fruity deliciousness, which in my brain conns me into thinking I’m being somewhat healthy. The cocktail is a little sweet, a little tart and with a little bit of a bitter undertone. You’ll need 4 parts satsuma (fresh squeezed), 2 parts pomegranate juice, 1 part simple syrup and 1 part Campari. For the simple syrup you need 1 part sugar and 1 part water which you place in a pot and bring to a boil, stirring until the sugar has dissolved and cool. Simply, fill a tall glass with ice. Pour Satsuma juice over ice; set aside. Add the pomegranate juice, simple syrup and Campari into a cocktail shaker and shake until combined. Pour over pomegranate and Campari mixture over Satsuma juice. The name alone gets me in the Christmas spirit. Coconut cream, vanilla vodka, and creme de cocoa combine in this frosty cocktail that tastes just like you’re drinking an Almond Joy. It’s a pretty sweet cocktail, so they go down easy. Almost like you’re drinking a cookie or candy bar, which I know during Christmas we all dip into. 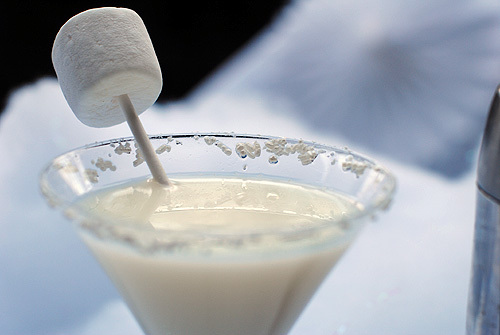 You only need 1 oz Cream of coconut, 1½ oz Vanilla Vodka amazing on its own BTW), 1½ oz Creme de Cocoa and ice. It’s really easy and straight forward to make; in a cocktail shaker filled with ice, combine cream of coconut, vanilla vodka and creme de cocoa. Shake until well chilled and combined. Strain into an ice filled glass. Simple and delicious; a guaranteed hit at any Christmas party! 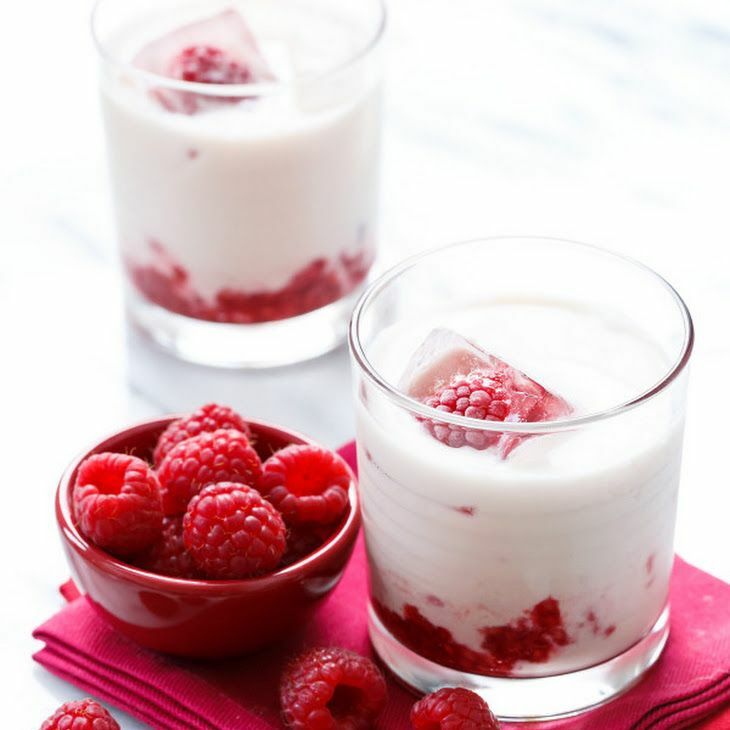 This twist on a classic White Russian features black raspberry liqueur and fresh muddled raspberries. For a beautiful touch, top with raspberry ice cubes. Firstly, make your own ice cubes by filling a silicone ice cube tray 3/4 full with water (slightly under-filling each cube will account for the volume of the raspberry) and plop a single fresh raspberry in the middle of each cube. Freeze overnight until solid. These raspberry ice cubes will make for a stunningly unique presentation, and you’ll get a little fruity bonus in your glass when the ice finally melts. You’ll need, 3 fresh raspberries, ice cubes, 1 ounce heavy cream, 1 ounce Chambord, 1 ounce vodka. All you need to do to create this divine cocktail is, muddle raspberries in the bottom of a glass. Add ice. Pour cream, Chambord, and vodka over ice. Stir well to combine. YUM! How cute is the name of this cocktail?! Frosty flavors make this a cool cocktail you’ll want on Christmas day (and every day after that). It’s basically the winter version of a piña colada. 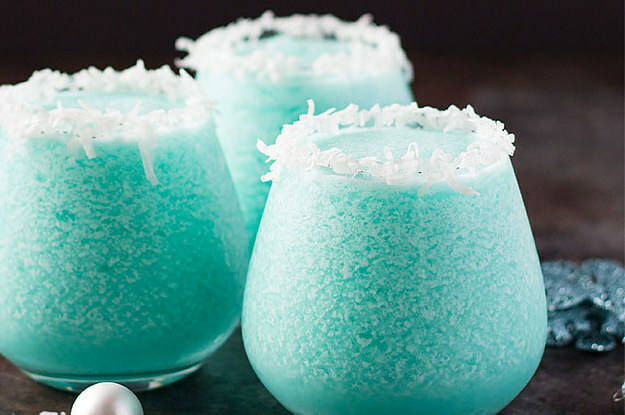 The ingredients you’ll need are 1 tbsp light corn syrup or simple syrup, 1/3 cup shredded coconut for garnish, 3 cup ice for a thicker drink, use 4 cups, 1 cup pineapple juice, 1/2 cup vodka or light rum, 1/2 cup Blue Curacao and 1/2 cup cream of coconut (not coconut milk). All you have to for this cocktail is, on a small plate, add shredded coconut. Wet the rim of a glass with simple syrup and gently dab the top the glass in the shredded coconut, coating the rim. Add ice, pineapple juice, vodka, blue curacao, and cream of coconut to a food processor. Pulse until smooth, about 2-3 minutes. Serve immediately (as if we could wait). Argh, I cannot wait to try this one. You’ll need 1 single serving Strawberry Häagen-Dazs ice cream, 1 single serving Vanilla Bean Häagen-Dazs ice cream, 1 ounce Smirnoff Peppermint Twist, 1/2 teaspoon Mint Syrup, 2 squares Ghiradelli Peppermint Bark, chopped and 1 Candy Cane, crushed. 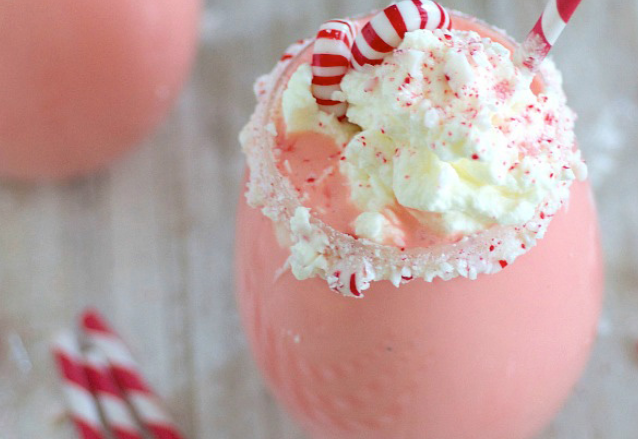 Blend together strawberry and vanilla bean ice cream, Smirnoff Peppermint Twist, mint syrup, Ghirardelli Peppermint Bark and crushed candy canes, then get ready to enjoy sip after pepperminty sip. UH-MA-ZING! All these cocktails sound scrumcious and I cannot wait to enjoy making and trying these! I may even have a cocktail night as an excuse to make every one!